PinoyMacLovers | Apple Philippines News, Mac Tutorials, Apple Reviews, Mac Tips, and More! Apple, Mac, iPhone, iPad news reviews, tips, articles and tutorials. Hey, everyone! 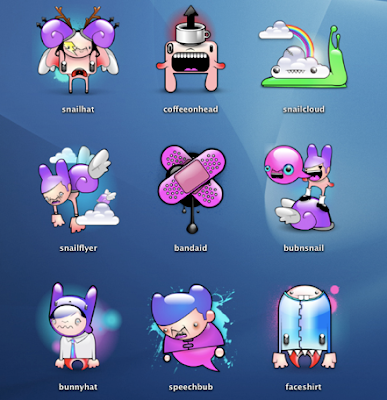 I've got some links to some free and cute Mac icons that I've found from around the interwebz. If you're tired of the default Mac icons that you've got, and would like to change things up a bit, then you can try any of the cute and adorable Mac icon sets below. I've found some cute Mac icons that are really colorful, there are some that are sweet and tasty (if we could eat them! ), Asian-inspired ones, and some that are strange but cute nonetheless! So let's start the cutie-fication of your Mac with these cute Mac icons! These cute Mac icons are free for your own personal use. So just use them to make your own Mac desktops cuter. If you'd like to share them with others, just post the link to each creator's download page. PinoyMacLover is a Mac enthusiast who cannot live without his iMac and high-speed Internet connection. He enjoys blogging and has a voracious appetite for information, thus the many hours he spends surfing the web. He also likes the taste of Mcdonald's french fries dipped in sundae ice cream. Information on this site may contain errors or inaccuracies. PinoyMacLovers is provided "as is" without warranty of any kind as to the correctness or reliability of the site's contents. PinoyMacLovers, and the author thereof, shall not be held responsible or liable, under any circumstances, for any damages resulting from the use or inability to use the information within. Furthermore, PinoyMacLovers is in no way responsible for or has control over the content of any external web site links. PinoyMacLovers is an independent web site and has not been authorized, sponsored, or otherwise approved by Apple Inc.
Apple, Apple Logos, Macintosh, and Mac OS Logos are registered trademarks of Apple Inc. All other trademarks mentioned belong to their respective owners. If you own rights to any of the content seen here, and do not wish them to appear on this site, you may send an email to copyright [at] pinoymaclovers [dot] com, and they will promptly be removed. The privacy of our visitors to PinoyMacLovers.com is important to us. At PinoyMacLovers.com, we recognize that privacy of your personal information is important. Here is information on what types of personal information we receive and collect when you use and visit PinoyMacLovers.com, and how we safeguard your information. We never sell your personal information to third parties. We also use third party advertisements on PinoyMacLovers.com to support our site. Some of these advertisers may use technology such as cookies and web beacons when they advertise on our site, which will also send these advertisers (such as Google through the Google AdSense program) information including your IP address, your ISP , the browser you used to visit our site, and in some cases, whether you have Flash installed. This is generally used for geotargeting purposes (showing New York real estate ads to someone in New York, for example) or showing certain ads based on specific sites visited (such as showing cooking ads to someone who frequents cooking sites).